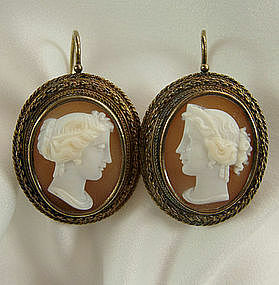 Fabulous antique 14KT gold mounted earrings with exceptionally detailed and executed Neoclassical shell cameos set in Etruscan revival wiretwist frames. With shepherd's hook backs. Circa 1860. The metal tests positive for 14KT gold with jeweler's acid. Together they weigh 8 grams. Extremely wearable, in excellent condition. 1 3/8 inches long and 7/8 inch wide. Photos enlarged to show detail.